I know, I know, Thanksgiving isn’t even here yet. But it’s almost Thanksgiving, so it’s almost time to think about Christmas right? In our household, we were trying to figure out if we should put our 3 foot-tree up with a toddler running around, wreaking havoc around the house. Last year, we put it up but barricaded it with the gate. But this year, we know she’ll be more curious, being two and all. So I decided to google trees that would be good for toddlers and came across the felt Christmas trees! 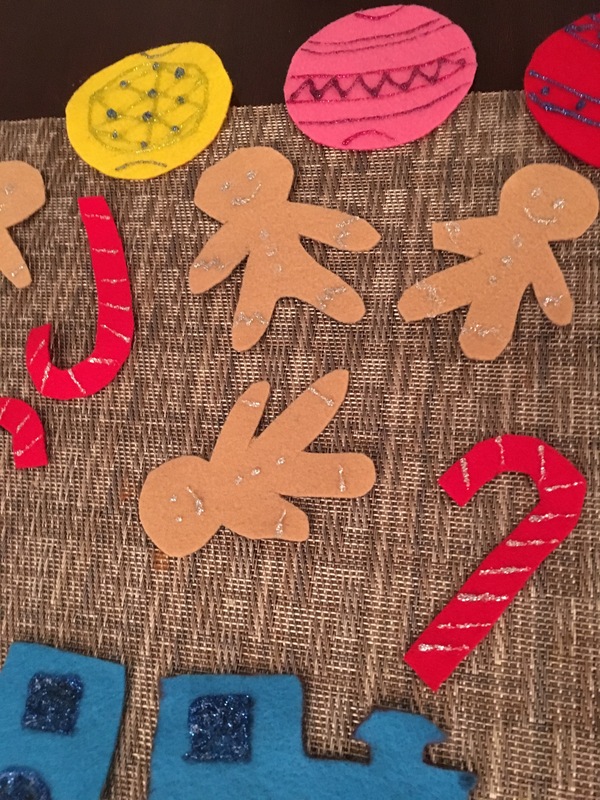 Since they stick to each other, you can create ornaments for the felt tree with felt and bam! Your toddler can put on and take off the ornaments for as long as they want. Maybe this will be a good distraction so if we put up a tree, she has her own to play with :). I figure I can write this blog with simple instructions on how to make it in case you are wondering :). So off to Michael’s Craft Store I went to buy my materials! Felt felt felt! And ribbons, if you want garlands on your tree, small sewing kit (I already owned one from before), scissors (with pattern cuts if you want), and glitter glue pens (optional). So I started off with the tree part! Since it’s hard to write on felt material, I used scotch tape instead. It was easy enough to take it off without really damaging the felt. I only outlined half of the tree because I then folded it in half and cut it that way, so it would be fairly symmetrical. That’s the hardest part really. I then cut a rectangle from the brown felt material and attached it to the bottoms of the tree. I just sewed on the corners because I didn’t know if tape would hold well. For the star and the trains. You can draw it on a piece of paper first, then cut it and use it as an outline. It just helps for those like me who are not too great with drawings. For the snowflakes (shown in later pictures), I made paper snowflakes first and used that as my stencil on the felt. I also used metallic ribbons to create the garlands if you want. I sewed mine on the ends but took it all out later because she kept trying to take it off anyway. I also sewed the star on there just so it stays at the top. Time to put it on the wall! I used heavy duty packing tape and taped the tree trunk, the star, and all the pointed parts of the tree. Then I let her go at it! After she went to bed, I had an idea and decided to embellish the ornaments! Glitter glue pens are amazing! Ok, so went a little cray-cray with the glitter but loved the ending! Happy crafting!!! And happy holidays! !